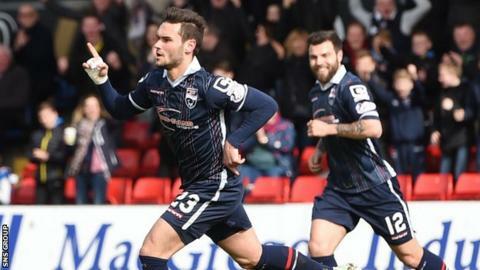 Ross County striker Alex Schalk believes his side may benefit from the pressure on Celtic following their Scottish Cup defeat by Rangers. County go to Parkhead on Sunday for a third time in the Premiership this season, having lost 2-0 in both games. But after beating Ronny Deila's side 3-1 in their League Cup semi-final in January, Schalk believes they could be vulnerable after their latest cup exit. "They will be under a lot of pressure," Schalk told BBC Scotland. "They expect to win the title now as they've lost two cup runs. Fans will be putting them really under pressure. "They will be really sharp and I think they'll want to get a couple of goals in the first half-hour to get a big win against us but I don't think they are that good to out-play us on Sunday. "I think we can take advantage of their mistakes. Maybe they're a bit nervous because of the pressure and [we can] get a result." Schalk scored the decisive third goal in that 3-1 semi-final win over Celtic and the winner against Hibernian in the final as County won their first piece of major silverware, before clinching a top-six Premiership place. Talks with Schalk to extend his contract beyond the end of this season are "ongoing" with manager Jim McIntyre keen to avoid over-confidence in his squad despite Celtic's recent troubles. "We certainly won't go into it over-confident," McIntyre said. "We know Celtic, on their day, are capable of scoring a right few goals." Celtic's Scottish Cup exit means there is no European place for finishing fourth. But McIntyre insists achieving that is still important to the club, who are one point behind Motherwell who currently occupy fourth, with St Johnstone ahead of County on goal difference in fifth. "The placing money is worth a few quid to the club and that can be getting an extra player in, or a couple of players. The three clubs will be desperate to secure fourth as it will make a difference to next season. "That [a European place] would have been the icing on the cake but for me it's just all about finishing fourth now."